Originally conceived for dive expeditions, the Sea-dweller is the ultimate tool watch. It was officially introduced for "civilian" use in 1967. While the earliest prototype examples featured only a single line of text, "Sea-Dweller", in red, Rolex later printed both the depth rating and Sea-Dweller signature in a bold, scarlet hue, which we see on the present watch. The Sea-Dweller's biggest technical innovation was the helium escape valve. 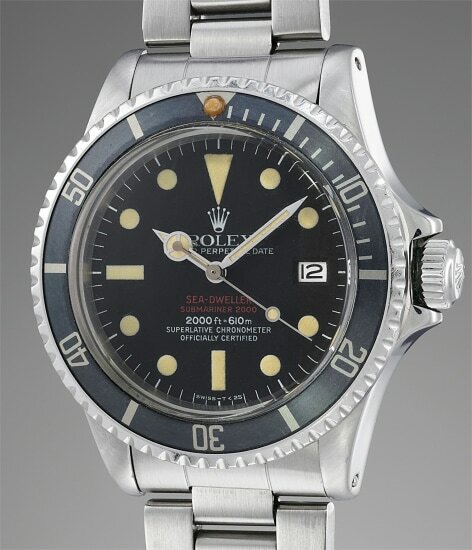 During the 1960s, most watches did not have the capacity to submerge into great depths without breaking. The Helium Escape Valve allowed helium gas, which built up underwater, to be released during decompression. This example is fitted with a Mk4 dial, evidenced by the large and spiky coronet. Correct for a 4.223 million serial number, it is the most classic dial iteration found on the market. The dial has aged gracefully, exhibiting warm and all-matching patina on the hands and numerals. The case is offered in crisp condition, still showing bevels on the side of the lugs. This lot is accompanied by its original punched guarantee, as well as the fitted presentation box and outer packaging.